Significant numbers of people in South Dakota rent boats each year for family vacations, fishing, skiing, and other recreational, water activities. Often potential boat buyers may rent a boat as a way of comparing models and types of boats to get a better idea of which boat they would prefer to purchase. Most types of boats are available for rent. Inflatable boats, canoes and kayaks are rented for leisurely or adventurous river getaways. Larger craft are rented for fishing or a family get togethers on larger lakes, rivers and coastal waters. 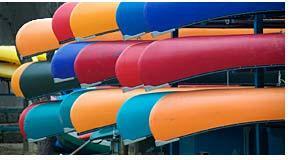 We list South Dakota boat information by city for your convenience. We include major cities like Belle Fourche, Buffalo, Mobridge, North Eagle Butte, Spearfish, Aberdeen, Gettysburg, Sisseton, Watertown, Webster, Custer, Fort Pierre, Hot Springs, Mission, Rapid City, Brookings , Chamberlain, Huron, Mitchell and Sioux Falls. Contact local boat dealers and fishing boat dealers for boat rental information. Boat rentals for skiing, fishing, cruising, sailing and just plain fun in waters throughout South Dakota may also be available at marinas. Some of the marinas in SD include Bush's Landing Lake Oahe, Shadehill Reservoir Marina, Lake Sharpe Marina, Lake Thompson Recreation Area Marina Launch, Angostura Recreation Area Marina, Pactola Pines Marina, Dock 44 Marina and Lewis & Clark Marina & Resort. Boats of all types for rent in South Dakota. Throughout the state one can rent sailboats, pleasure boats, family boats, yachts, pontoon boats, fishing boats, bass boats, speedboats, inflatables, jon boats, cruisers, cuddy cabin boats, canoes, car toppers, ski and wake board boats, deck boats, aluminum boats, electric boats, jet skis, personal watercraft and fish-and-ski combos. Many of these boats are for rent at multiple locations throughout South Dakota. 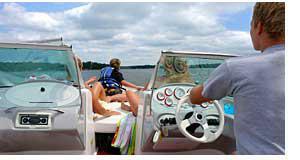 Search for boat rentals in SD by choosing boat dealers listed by region of the state. They are then organized by proximity to cities, waterways and other attractions.